Alright, alright, I finally did it. 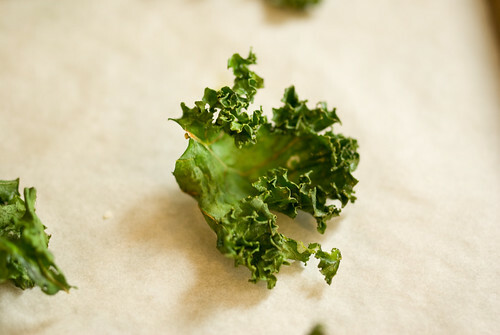 I made kale chips. But only because everyone else in the food blog world has already made them and raved about them. Well, and because I love kale and it seemed stupid to pass up a potentially fabulous way of cooking it. 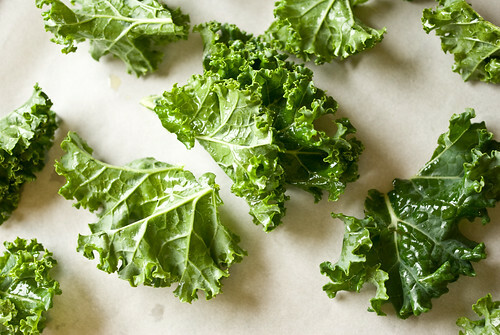 This post over on Use Real Butter was the last straw as far as I was concerned (her kale photos are gorgeous), so when I picked up a bunch of kale for a pot of soup, I saved out a bowlful of leaves to roast into chips to go with my sandwich at lunch. It was, I have to admit, very good. The leaves lost all chewiness and became, instead, ethereally crisp and delicate, dissolving on the tongue with a slight crackle. I ate something like half a bunch of kale all by myself without hardly noticing. I intend to make these chips again very soon, perhaps with a bit of cumin sprinkled over, or a little dipping sauce of garlicky yogurt. And need I point out that these would be really fun to serve with drinks? Note: There are recipes for this all over the internet. I made the Use Real Butter version, but Deb has a good-looking one over at Smitten Kitchen – as well as a great serving suggestion. Kale popcorn? Yes, indeed. Rats, I may just have to do it…get in line for last. I made them again for today’s lunch, this time with lacinato and a dusting of cumin and paprika. Make no mistake, it still tastes like kale, but the texture is compellingly crisp. I do think some sort of runny dip, like yogurt or a homemade ranch dressing, would be good.